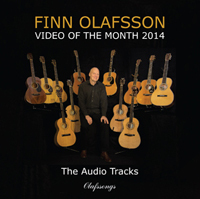 In order to give all the guitars Finn Olafsson plays in the videos equal conditions for optimal sound, a new set of exactly the same brand of phosphor bronze strings was put on on each and every guitar. 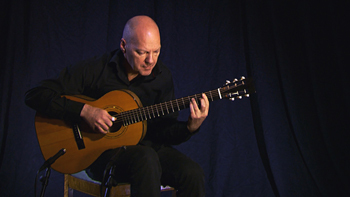 When I composed this guitar piece some years ago I had the feeling of being in Provence - in the south of France, near to the Mediterranean. And now, when I play it or listen to it, I imagine that it's in the end of May, June is soon taking over, and I'm in the middle of a huge field, an ocean, full of blue flowering lavenders. And I'm overwhelmed by the scent of them. 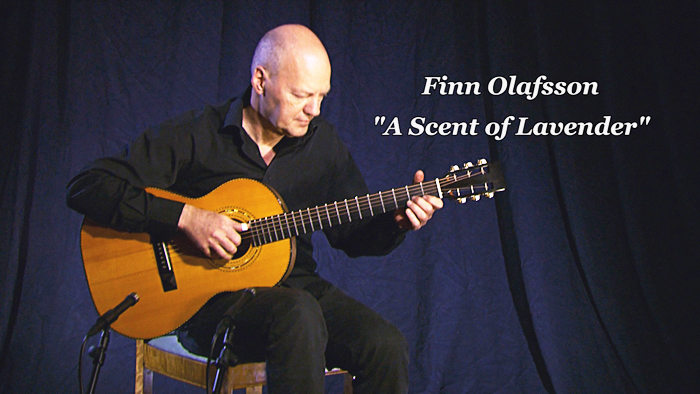 I guess that "A Scent of Lavender" is somewhat influenced by the music of some of the South European composers who lived during the Romanceticism - e.g. like Spanish guitarist and composer Fernando Sor (1778-1839), who was born in Barcelona and died in Paris, or Italian Ferdinando Carulli (1770-1841), who was born in Naples and died, like Fernando Sor, in Paris. During a 3-4 year long periode in the 1970s I did some self-studying of the playing of the classical nylon string guitar. 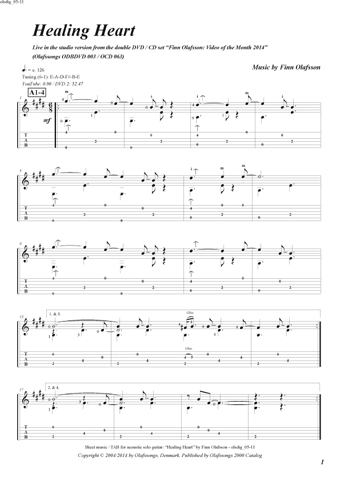 I played a lot of music written by Sor and Carulli and found that it was really fascinating to play. To me, their music is the epitome of southern music and I'm convinced that playing their music at that time has left its marks in me. In parenthesis I find it very interesting the way that different guitar genres shape one another - and how the music by former living composers sounds in new guitar arrangements - e.g. 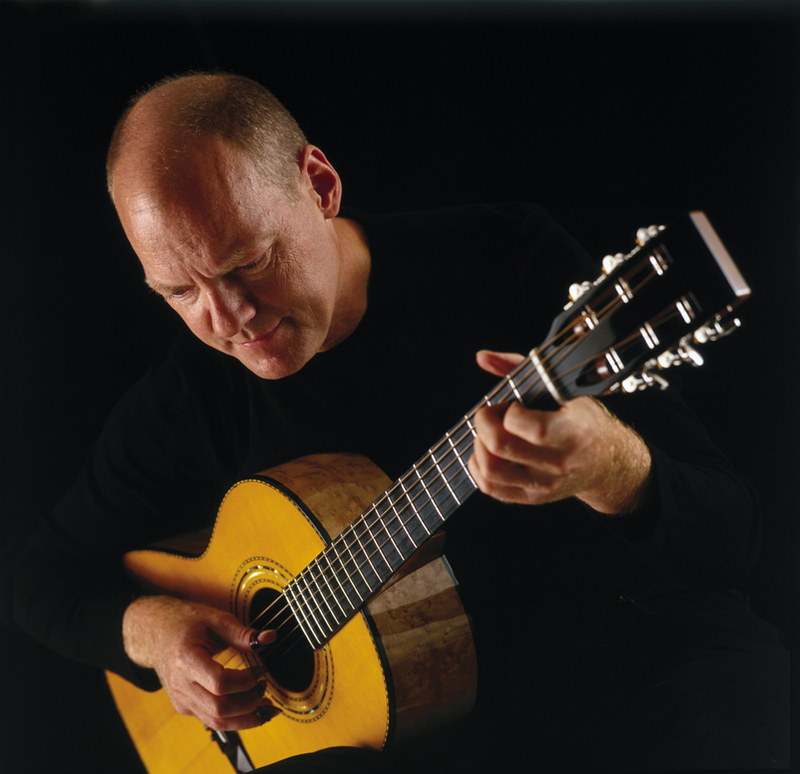 John Renbourn's steel string guitar arrangements of the Renaissance-lute-music of John Dowland - or Jeff Beck's electric guitar version of Giacomo Puccini's "Nessun Dorma". Jeff Beck's acoustic guitar version of "Greensleeves" on his album "Truth", which was a great inspiration for me, is another example. When I'm composing in the G major tuning the character of the tunes becomes very major-like, open, friendly - and also very South European. Just listen to tunes I have written like "Down the Mediterranean", "The Green Parrots of Barcelona" and "The Troubadour and The Ballerina" recorded on my CD-album "Acoustic Guitar 2". 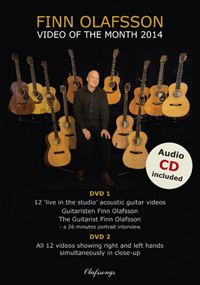 Other examples are a couple of guitar pieces I wrote and recorded with Anders Roland: "Globetrotter" from CD-album "Globetrotter" and "Havblik" ("Still Water") from CD-album "DUO". If you go to the CD Gallery on this website you'll find sound clips of all these tracks. You'll also find a video version of "Havblik" ("Still Water") on YouTube. 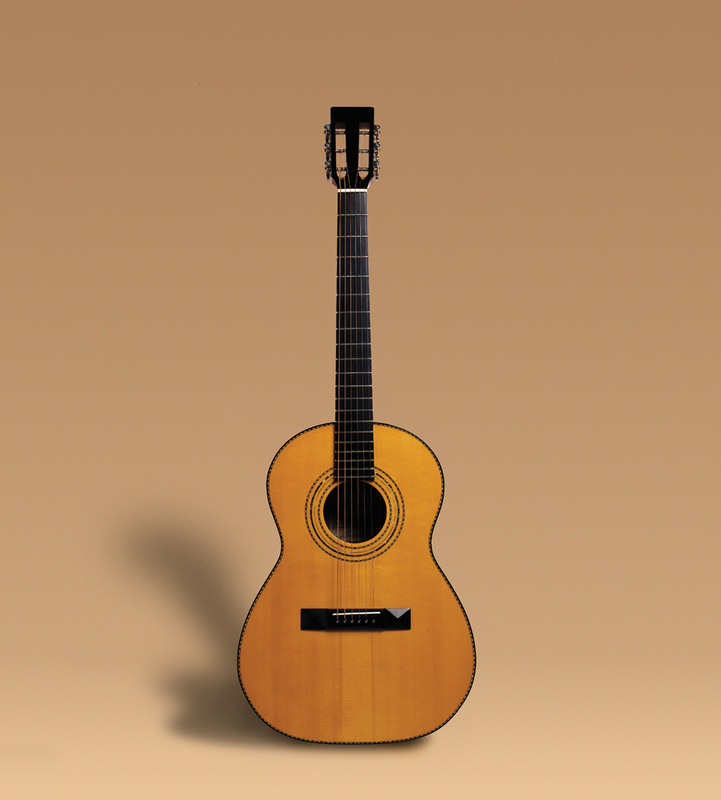 The beautiful acoustic guitar I'm playing in this video is indeed one of a kind. It was built in 2001 by Danish luthier Ole Kehlet, Kehlet Guitars, and in my point of view it represents a new era for this very fine guitarmaker's creations. 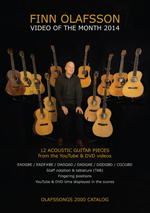 In 2001, with the starting point at the guitar exhibition "Strøm til" ("Power On") at Danish Music Museum in Copenhagen, Denmark, Ole Kehlet found a new outlet for producing acoustic steel stringed guitars, which should no longer be limited to be affordable due to the competition in the very small market of guitars in Denmark, but an outlet for guitars which were built to reach the highest possible Kehlet Guitars sound quality. This was achieved by using the very best tonewoods and by investing even more hours, energy and accuracy into each guitar. Ole Kehlet also developed his great skills for producing outstanding inlayworks as the demands for this kept increasing. This Kehlet model is called a Folk model in Kehlet terms. The length of the body is approx. like a Martin 00-12 fret model but it is a little wider and it is 1.3 cm (approx. 0.5") deeper. This comparison is just to give you an idea of the size because the shape of the Folk model is of its very own. It has 14 frets to the body, a rather large pyramid bridge and an open headstock. 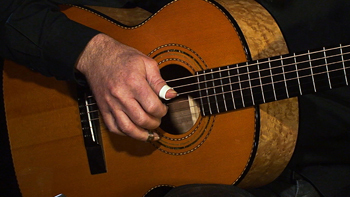 The top, or with other words, the soundboard, is made of German spruce and was vintage-toned to give the guitar the appearance of an older instrument. That's the reason that this specific guitar is called a Folk Vintage. To my knowledge it's even the one and only Kehlet Folk model in existence with such a top. The back and sides are made of a gorgeous set of quilted birds eye mable. 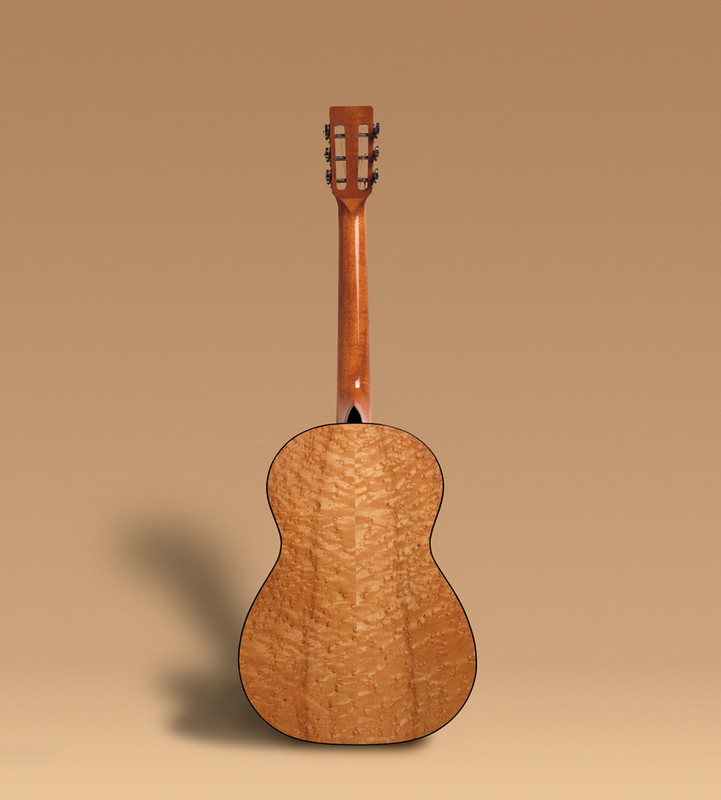 In general, the Kehlet guitar is arch topped with a 15 degree arched top and a 20 degree back. In this way it differs from most American guitars - such as most Martin models - which are flat top instruments. Recently, Kehlet guitars has added a new "slap top" model with a 12 degree arched top. It also sounds very nice in the ordinary EADGBE tuning - and I'm sure that most guitar players would find the Kehlet Folk model suitable for any guitar tuning.